Cats have a knack—usually after you have allowed them into your heart and home—of sometimes acting like they are holier-than-thou. I mean, it’s with good reason. They are adorable, brilliant creatures so it makes sense that on occasion they will feel superior. Or in some cases most occasions. However, they are not to blame for this because we humans have been worshipping them for years. When we think of societies that have worshipped cats, the ancient Egyptians are usually the most well-known. Not surprising since they worshipped a half-woman, half-cat goddess called Bastet. They also had other cat-centric deities including Mafdet and Sekhmet. 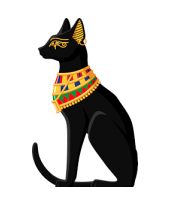 The ancient Egyptians viewed cats as magical creatures and often lavished them with jewels. Penalties for injuring or killing a cat were severe, and when a cat passed away, the entire family would often shave off their eyebrows in a show of grief and mourning. The ancient Chinese had a cat goddess called Li Shou who was thought to favor pest control and fertility. They also believed that originally the gods appointed cats to run the world; however, the cats had no such interest and nominated humans for the task instead. The ancient Romans kept cats as pets, not for pest control—they had trained weasels for that task. The Romans viewed cats as independent beings and not ones to be used for such mundane work. The Norse pictured their goddess Freya riding on a chariot pulled by two giant cats, and Norse farmers often left offerings to cats to ensure bountiful harvests. So as you can see, humans have a long and storied history with their feline companions which often includes seeing them in a rather revenant light. No need to feel silly if you apologize to your cat when you wake them up by rolling over at night—it’s kind of in our DNA at this point.